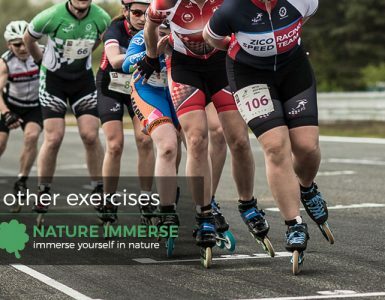 Our guides has made clear that inline skating will help you to burn calories—but how, exactly? What type of skating will burn the most calories? How do the muscles worked contribute to the calories that are burned? 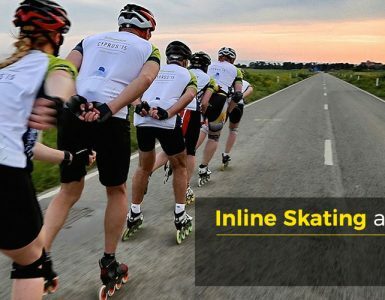 These tips details the science behind inline skating and calorie burn, helping you to understand just how this fitness routine will help you to melt fat. It is well-known that to lose weight, you must burn more calories than you consume. Burning more calories each day than your body replenishes through food forces your body to tap into its own reserves of energy, causing you to “burn” fat. The number of calories that you burn with an inline skating workout can be directly correlated to the amount of fat that will be burned down the line. Many studies have been done to research the amount of calories that are burned with different types of exercises. Remember that the consistent, general rule is that the harder you work, the more calories you will burn. This is simply a fact. This means that the harder and faster you skate, the faster you will burn calories. The longer you can maintain this level of workout, the more calories you will burn. Studies have measured the heart rate, calorie burn, and oxygen intake in athletes completing a variety of exercises, including cycling, running, inline skating for endurance, and interval skating. The average caloric expenditure of inline skating at a constant, steady pace will typically burn 285 calories in a thirty-minute period. If you increase your work effort and engage in interval skating (alternating periods of intense skating with periods of easy “rest” skating) you can burn approximately 450 calories in a thirty-minute period. Running and cycling each expend approximately 350 calories in a thirty-minute period. Inline skating is clearly comparable with these common exercises in terms of caloric expenditure, but does not cause the joint stress that you can get through running. Cycling burns a similar amount of calories, but does not require you to maintain a certain posture without support, and so does not give you the trunk strength that inline skating will. You can reap the caloric benefits of inline skating by working up to skating intervals. 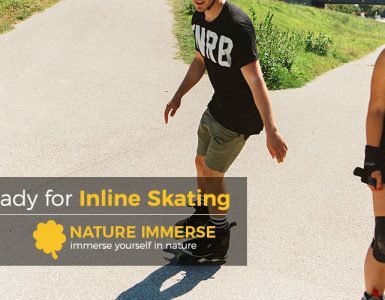 You can skate intervals by skating as hard as you can, maintaining a deep crouch, for one minute. Then skate at an easier pace, a “rest” pace, for one minute. Do not stop completely! There are numerous apps that you can download to time you as you skate. You can also skate intervals by skating up and down a steep hill. Skating up is the intense period, and you rest as you come back down. Do this for thirty minutes, and you will see quick results. If you are not yet ready to engage in interval skating, you can still burn loads of calories by maintaining a steady, comfortable pace for a minimum thirty-minute period. If you are trying to work up to interval skating, begin with one interval. Start your skating workout with an intense burst of skating for one minute, then rest for five minutes before trying another one-minute interval. Gradually shorten your time between intervals until your rest period is one minute or less. As you skate to burn calories, consider your weight. Your weight has a strong influence on the number of calories burned while skating. The more you weigh when you start, the more calories you will burn in a thirty-minute period. There are also different types of skating, so consider that into your caloric calculations. When quad skating, a 150 pound person will burn approximately 485 calories in a sixty-minute period. However, when inline skating, that person at 150 pounds will burn approximately 600 calories per hour. Remember, the longer and harder you work out, the more calories you will burn! However, it is important that you keep your overall health in mind when skating or completing any other workout activity. “Longer and harder” should only be your motto to a point! Studies show that aerobic and anaerobic exercise that lasts for longer than an hour can actually have seriously detrimental effects to your body. There is definitely such a thing as overworking, and you should avoid it at all costs! While you want to see results quickly, maintaining your results is about engaging in an overall life change. You cannot make a life change by striving to lose weight as fast as possible, burning out, and giving up. Thus, you must make sure that your workout period never extends longer than a sixty-minute period. Working out for longer than this taxes your heart, muscles, and lungs, and paves the way to serious injury. Take care of yourself, and be practical in your weight loss expectations. You will see the pounds melt off, but you must be patient to an extent. Remember that caloric expenditure is largely about maintaining a working heart rate. To burn an optimal number of calories, you want to maintain a heart rate of approximately 148 beats per minute. How do you calculate this? Well, you can do it yourself, or you can get a fitness watch with a heart rate monitor. These can be found, relatively inexpensively, at your local Walmart, Target, sports store, or even online. Typically worn around your wrist, these can be very effective heart rate monitors. If you don’t want to expend the cash, get out your phone or watch and set a 10-second timer. Find your pulse. You can find your pulse on your wrist or neck for most efficient monitoring, or you can try to feel your heart through your chest. Start your timer and count how many heart beats you feel before the timer goes off. Multiply this number by six, and you have your heart rate! So, for example, if you want your heart rate to be going a minimum of 148 beats per minute, you should count about 24-25 beats in a ten-second period. This seems like a lot, but as I am typing this guide, my heart is beating at a rate of 14 beats in a ten-second period, or 84 beats per minute at rest. So, to burn the maximum amount of calories, you want to work out harder for longer. Interval skating is the best option for burning the calories that you want. Maintaining a heart rate of 148 beats per minute is optimal for caloric expenditure! Remember that reaching this optimal range may take time, and give yourself time to take a break when you need it. Pushing yourself too hard initially can lead to serious injury. Tracking your caloric expenditure helps you to ensure that you are getting the best workout possible, and gives you the ability to track your weight loss more efficiently.